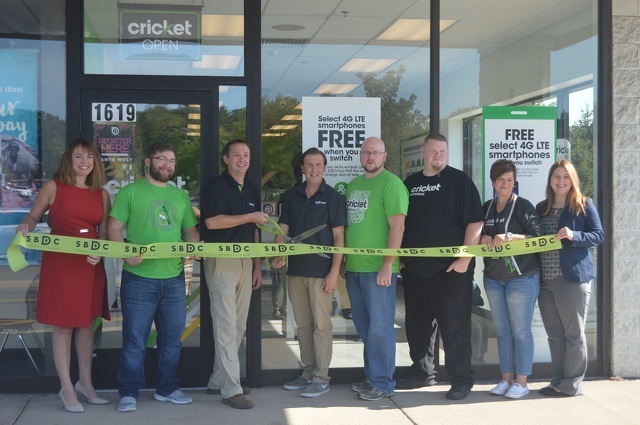 (Submitted photo) A new State College Cricket Wireless store recently held a ribbon-cutting ceremony. Pictured, from left, are Penn State Small Business Development Center executive director Heather Fennessey McWhorter, Aaron Wilson, One-Stop Communications president Michael Buffington, store manager Shane Niman, Jeff Butler, Steve Poorman, Dawn Pardoe and SBDC business consultant Jennifer Riden. STATE COLLEGE — One-Stop Communications and Cricket Wireless recently celebrated the grand opening of their new store, located at 1619 N. Atherton St. in State College. “We are thrilled to open a Cricket Wireless store in State College. We truly have something to smile about at Cricket, with competitive plans that offer unlimited talk, text and high-speed data access …. ,” said owner Mike Buffington. The community is invited to visit the newly remodeled Cricket showroom and check out featured sales on their latest products. Cricket Wireless offers unlimited smartphone plans starting at $30 a month, with no annual contract and a 4G network that covers more than 300 million people. For more information, call (814) 325-9413.